Kia Motors America teased its Super Bowl campaign during the Rams vs. Saints NFC Championship game Sunday. The premise of the solemn 30-second teaser is that every year, millions of dollars are spent on celebrity endorsements in Super Bowl ads. This year, for its 10th consecutive Super Bowl ad, Kia vows to do something different. 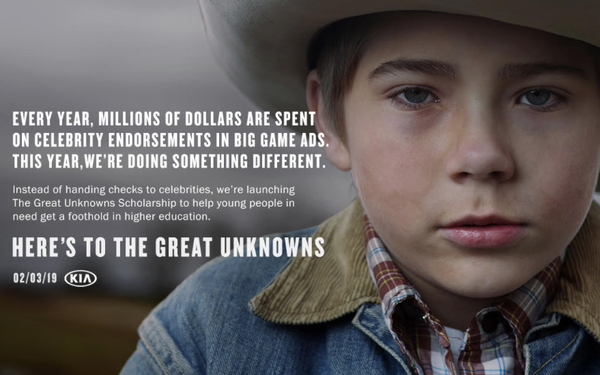 Instead of handing checks to celebrities, Kia is launching “The Great Unknowns Scholarship” to help young people in need get a foothold in higher education. A teaser page invites consumers to return on Feb. 3 to apply. The promised ad stands in sharp contrast to Kia’s recent celebrity-led Super Bowl efforts. Kia’s 2018’s spot starred Aerosmith rocker Steven Tyler, Melissa McCarthy led Kia’s 2017 spot and Christopher Walken starred in the 2016 effort. The teaser spot was created by David&Goliath, as will the Super Bowl spot.